An 8-year-old boy was so upset over the death of another boy that he wanted to do something to help. 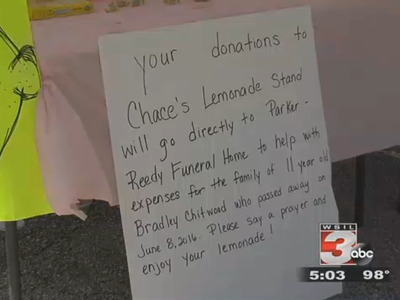 So Chace Patterson set up a lemonade stand in West Frankfort, Illinois, to raise money for Bradley Chitwood’s funeral. Although Patterson didn’t personally know the 11-year-old boy, who passed away earlier last week, Patterson knew he wanted to help the boy’s family in some way. 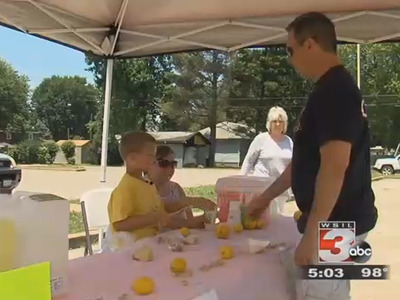 “You need to help people that need help,” Patterson said to local news WSIL. By offering lemonade to passersby on the street, little Patterson made a total of $924 at the end of the day. All the proceeds were donated directly to Chitwood’s family.